This interesting and long-established surname is of medieval English origin, and derives from the Hebrew male given name "Hevel", traditionally held to derive from the Hebrew "hevel", breath, vigour, used also in the figurative sense "vanity, worthlessness". This name was borne by the son of Adam who was murdered by his brother Cain (Genesis 4:1-8), and was popular throughout Christendom during the Middle Ages (circa 1200 - 1500), when there was a cult of suffering innocence which Abel represented. "Abellus", the Latinized form of the name, is recorded (with surname) in Documents relating to the Danelaw. Leicestershire, dated 1216, and an Abel de Etton', witness, was noted in the 1221 Assize Court Rolls of Warwickshire. The surname first appears on record towards the end of the 12th Century (see below), and further early examples include: Richard Abel (Buckinghamshire, 1273) and Thomas Abelle (Yorkshire, 1301). In the modern idiom the name is variously spelt Abel, Abell, Abele and Able, with patronymic forms including Abeles, Abelson and Ableson. 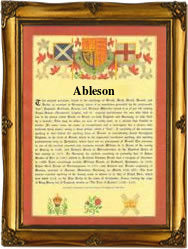 Abel is also recorded in Scotland from an early date, one Master Abel being noted in Documents concerning the Abbey of Kelso in 1235. The early church register recordings include examples such as Evans Abelson, who was christened at St James Clerkenwell, London, on October 6th 1578, and Edward Ableson, the son of Myles and Patience Ableson, who was christened at the famous church of St Dunstans in the East, Stepney, on December 20th 1643. The coat of arms most associated with the name has the blazon of a silver field, charged with twelve gold fleurs-de-lis on an blue saltire. The first recorded spelling of the family name is shown to be that of William Abel, which was dated 1197, in the "Pipe Rolls of Essex", during the reign of King Richard 1, known as "Richard the Lionheart", 1189 - 1199. Surnames became necessary when governments introduced personal taxation. In England this was known as Poll Tax. Throughout the centuries, surnames in every country have continued to "develop" often leading to astonishing variants of the original spelling.